In a highly sensitive move, the Victorian Government is considering a plan that could buy the logging industry out of a forest to save the state's faunal emblem, the Leadbeater's possum. The Leadbeater's possum is one of the most critically endangered animals in Australia and its habitat in the tall mountain ash forests of the state's central highlands is in decline due to logging and fires. A long awaited industry taskforce has now been set up to consider whether logging and the Leadbeater's Possum can both continue in these forests. 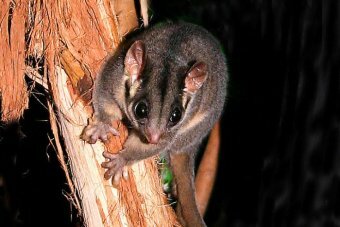 Professor David Lindenmayer from the Australian National University (ANU) said the timber industry must stop logging the central highlands mountain ash forest if the possum is to have a chance of surviving. "Lots of places are being logged that shouldn't, the big old trees aren't being protected, this leaves animals like Leadbeater's very little chance of surviving the next 20 to 30 years," he said. Dave Blair, a senior research officer with ANU, said recommendations handed down by the Leadbeater's Possum advisory group last year are not adequately protecting the possum. "The science we have been working on for decades now was largely sidelined with a lot of the recommendations either being extremely watered down versions of it or proposing things that we know already aren't going to work," he said. Scientists from the ANU and conservationists are pushing for a Great Forest National Park, which would provide a much larger ecological reserve for the possum. 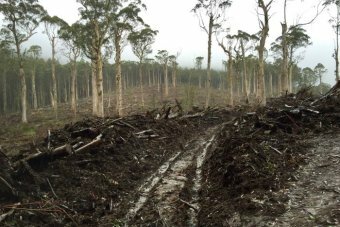 The state owned logging corporation, VicForests, said that would mean the end of the timber industry in the central highlands. VicForests general manager of planning Nathan Trushell, said: "It's not a surprise to anyone, if the Great Forest National Park was implemented in its current form that would result in the end of most of the Victorian hardwood timber industry." The Victorian Government is under intense pressure to do more to save the possum. In the last month, Federal Environment Minister Greg Hunt has twice called on it to take action. "We listed the Leadbeater's Possum as critically endangered and it's up to them now to be absolutely clear what their plans are because I understand that logging has recently commenced in new areas and I think it's time for the Labor Government in Victoria to be upfront about their plans," he said. Mr Hunt has also invited the Victorian Government to apply for funding that could pave the way for it to buy the timber industry out of the central highlands mountain ash forest. If the submission was approved it would allow the State Government to bid for millions of dollars a year from the Emissions Reduction Fund to not log in Leadbeater's Possum forests. It is a highly sensitive issue for the State Government because of its potential to upset one of its key union supporters, the Construction, Forestry, Mining and Energy Union (CFMEU), which represents timber workers. Mr Trushell said even if millions of dollars of Emissions Reduction Fund money was available, it would not be easy or simple to move the timber industry out of the central highlands. "Look, I think these are the types of issues that would be worked through the industry taskforce," he said. "We're talking about a substantial industry. The reality is the solutions aren't easy. The alternatives aren't easy. "Ultimately if you were to close down the timber industry in eastern Victoria, you would need to substitute from somewhere else." Mr Trushell said it would also have a significant impact on some regional communities. "It's an important industry regionally. It contributes to significant socio-economic benefits. You need to look at the whole picture." The Victorian Government declined to be interviewed. But in a statement a spokesperson said the terms of reference for the taskforce are currently being formalised. Vulnerable native species would benefit if New South Wales' national parks were opened up to controlled logging, according to the state's timber industry. 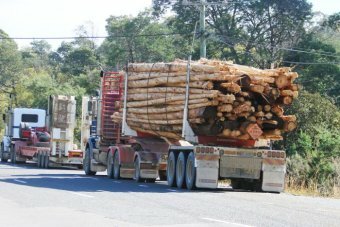 Timber NSW says controlled logging should be allowed in the state's national parks and Crown lands as well as in state forests. That view is supported by Senator Richard Colbeck, Parliamentary Secretary to Agriculture Minister Barnaby Joyce. In an opinion piece published today on ABC Environment, general manager of Timber NSW Maree McCaskill and industry consultant Nick Cameron argue that the current legislative arrangements for land management in NSW are failing vulnerable species. They argue that a unified approach to "tenure" — the legal term for land management — would have better results for vulnerable species, communities and the timber industry. "The tenure system offers no broad landscape management and accountability. Frequently, forestry departments focus on the profits of timber production, park managers focus on the records of individual species and managers of Crown lands focus on administration," they wrote. "Native forests are not static museums that can be locked up forever. Like your own garden or backyard they need careful management to keep them healthy. "Through preventative measures like ecological thinning and fire mitigation, the timber industry can play an important role in active, adaptive management to tackle common threats across all tenure types." In a recent interview for Radio National's Background Briefing, Senator Colbeck made calls for a similar "broad landscape" approach to forest management. "If you look at, for example, native species decline in this country, the rate of native species decline inside of national parks is hardly different at all to what it is across the rest of the landscape," he said. "In my mind, what that says to me is you need to manage the entire landscape to ensure that those values that you're looking to achieve are maintained. You can do that with sustainable forest management principles." He said such an approach to forest management was being adopted globally. "If you go to a lot of the landscape and forestry management conferences around the world right now, it's about broad landscape management," Mr Colbeck said. "It's about managing the broad landscape for values. It's about managing the broad landscape for native species and doing what you can across that entire landscape, not just bits and pieces of it because if you do it that way I think that we're only going to continue to go backwards," he said. Ms McCaskill said forestry science professionals appeared to have been forgotten over the last 20 years of national park expansion, saying they had skills and knowledge that should be used. "The timber industry can provide harvesting and thinning services as it does now, under the controls applied and required by the EPA legislation, to reduce fire risk and improve forest health," she said. The proposal for a more consistent approach to forests comes on the back of allegations made last month to Background Briefing that high-grade timber is running out in NSW. In a statutory declaration, a north coast NSW landholder, Peter Roberts, attested that at a community meeting, a Forest Corporation NSW representative told him privately: "The hardwood forests along the coast have been flogged to death, there's no decent sawlogs left, the timber's all gone". Forestry workers who spoke to Background Briefing agreed, describing current forest practices as "murder" and "criminal". Nick Roberts, chief executive of Forest Corporation NSW, agreed that many areas previously available to loggers had been turned into national parks, however he disputed the suggestion the forests were "flogged". "No, that's not my assessment," he said, pointing to the example of lush forest at Bruxner Park that had previously been harvested. Logging national parks is not going to restore key habitat features: time will. Environmental groups have slammed the suggestion that national parks be opened to timber companies. "To suggest we can manage our way to high biodiversity through activities like logging is extraordinarily arrogant and misguided," NSW National Parks Association science officer Dr Oisin Sweeney said. "Protecting large, intact landscapes, controlling invasives and letting nature do the rest is our best approach." He disagreed with Senator Colbeck that other countries were moving to a more tenure-neutral approach to forest management. "Much of the world, including Europe, is moving [away from that] approach as 'rewilding' becomes a more and more popular approach to restoring natural values," he said. "The decline in biodiversity is a legacy of past mismanagement: we have fragmented all natural habitats, removed millions of trees from west of the divide as land was cleared for agriculture and timber, and logged all our old-growth forests. "Of course species have declined. Logging national parks is not going to restore key habitat features: time will."